Will Rogers Downs opened in August of 1987 as the second pari-mutual track in Oklahoma. At the time it was considered the showcase of Oklahoma horse racing though you wouldn't find any Fredrick Remington originals there. Things went down hill quickly as the track ran into financial difficulty. In 1988 the grand racetrack Remington Park was unveiled in Oklahoma City and Will Rogers Downs was no longer considered a showcase, in fact the track deteriorated rapidly. By 1989 Will Rogers Downs, was already in need of improvements. This can attest to it's spotty record of holding race meets till it went under for good in 2001. Most of the problems were financial but one year the infield toteboard got blown over and half the track was washed away. In anticipation of legalized gaming in Oklahoma, The Cherokee Nation purchased the derelict track in 2004, put two million into improvements and opened the casino in December, 2005. Shortly after that live racing returned in February of 2006. The track now holds two separate meets, one thoroughbred, the other quarter horse and mixed breed. The thoroughbreds run Monday, Tuesday and Wednesdays to take advantage of off-track and internet wagering when there is less competition. This format has seemed to work well as handles are improving yearly. In 2013 I finally made it to Will Rogers Downs, unfortunately I missed the thoroughbreds but got to see the quarter Horses. It was a beautiful late fall day but as a racino it had that familiar look, I only to ask one person where to buy a program. Good thing she knew, cause she was the only other person there, at least one not holding a bridle. The crowd wasn't that small, but it had that family and friends feel to it. Still it was nice to see some live racing. During the races the track announcer was promoting Saturdays family day program, which would be highlighted by a Zebra race. I was only half paying attention but I thought I heard him say that Calvin Borel's biggest thrill was winning a Zebra race, probably heard that wrong? I didn't get to go on family day but I did go over and visit the Zebras who had there own little area and for good measure I sat all day on the bench next to the truck that was home to the racing pigs. They were cute little buggers all cuddled together in their stall. 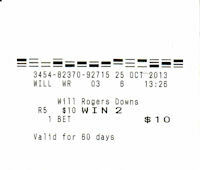 I had made an earlier trip to Will Rogers Downs when no racing was going on. The scary part about that was that there weren't many people at the casino. It is small but you would expect some kind of crowd, then again it's Oklahoma, you don't need a racetrack to have a casino. Maybe I went to Will Rogers in the nick of time. .